Kenitra – Today football stadiums have almost turned into holly places for worship or say pilgrimage. People have become regular visitors at football stadiums and seem to run away from the classical places of worship, be it mosques, churches, pagodas or synagogues. The stadium represents a refuge for the young to express themselves and interpret their freedom by using and applying a number of rituals which make the fans feel at ease. 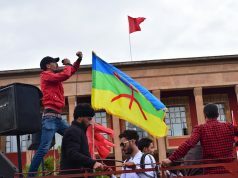 There’s no doubt that much freedom is allowed in the stadium- either in Morocco or abroad- which makes young people to take maximum advantage. Many practices that express the teenagers’ philosophy of life are not approved within the broader society and for this reason the stadium represents a shelter and a refuge for the youth to voice their tendencies. The youth utilize the space on the stands to set up a subculture which fits more their needs and ambitions. Such a newly created culture can sweep beyond the walls of the stadium to find a way into the broader society, despite the resistance from the dominate culture. Recently a number of people go to the stadium not for the match per se, but to enjoy the ‘roubla’ – a Moroccan Arabic word usually pronounced by teenagers meaning the hysteria which takes place in the stands. This ‘Roubla’ is created by a group of fans known as Ultras who identify themselves from the other fans on the stands by a number of codes and styles. Etymologically speaking Ultras is a Latin word, which means extra or something more than usual. Culturally it is a group of football supporters who work in an organization-like form. These fans have structure, members, principles and division of tasks. Ultras members work in an organized way and set goals and endeavor to reach them via using planning and good management. Ultras as a sub culture phenomenon was first founded in Brazil in 1967 by a group of fans named themselves Trocida. However, many Europeans believe that ultra is a European phenomenon par excellence. But what it is clearly known is that Ultras as a sub culture phenomenon has seen a revival process in Europe particularly in Eastern Europe and Italy, after a long time of stagnation and such creativity has been represented in the use of flames and lyrics. Helala is a well-known yellow rose in the city of Kenitra and it covers the whole city. During the French protectorate, Helala used to be exported to Europe for perfume manufactory, but today Helala rose has seen much eradication and extinction as a result of urbanization and pollution. Helala rose presents the symbol of the city of Kenitra and usually Kenitri people identify themselves by it. 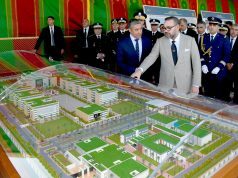 Helala boys, or ‘Welidat Kenitra’ as they are called, do not represent themselves alone, but they represent the whole city of Kenitra. Helala Boys ultras created a name which preserves their identity and culture unlike other Moroccan Ultras which borrowed Western ultras’ names. Tifo or “banner” in the English language is the symbol of pride and power of the ultras and it reflects self importance. Superiority and egotism is always presented when it comes to Tifo design and decoration. The Tifo is usually made of plastic and decorated with the ultras logo and it habitually conveys a message directed to a specific audience. Making the Tifo is the hardest duties of the ultras. The ultras participants come to the stadium hours before the beginning of the match to work on the design as well as the message it will convey and such a ritual can take the whole week. The Tifo, as I was told, is very sacred in Ultras culture and it must not fall down or be stolen by anther ultras because it represents the power and the identity of the organization. Zhou is an Arabic word which means celebration or enjoyment. Within Ultras philosophy, it is the belief of nonstop supporting. Ultras support the team from the beginning to the end in the same way no matter what the conditions are, whether the final score is bad or there is gusty weather. Supporting within the ultras culture is a sacred duty and no one should be noticed sitting during the match. It is related with the Zhou philosophy of the ultras. It is a violent reaction directed to members of the ultras who stop supporting during the match and this punishment can also include other Kenitri fans who do not belong to the ultras but who decide to sit at the place reserved for the ultras. Bouka is a harsh punishment to those who dare to break the law of the ultras. 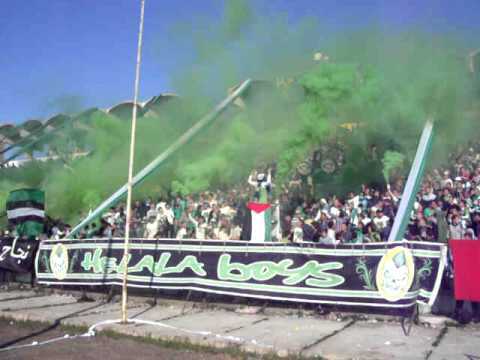 ‘Helala Eludma’ is the slogan of HB Ultras and can be translated into Helala, the greatest. This slogan depicts greatness and egotism which should be presented in Ultras culture. Most of the Ultras chants and songs include this slogan and you can find it written on most of the walls of the City of Kenitra as well. Concerning funding, ultras depend on self-funding and can not depend on any other source. Self-funding is one of the most important principle of ultras. They have yearly fund raising and sell ultras products like t-shirts, hats, scarves, etc to fund themselves. Like any other ultras, HB has a website which contains their videos, songs and photos. The net is also used to show muscles and frighten other ultras by expressions or photos which explain that. Facebook and Twitter are strongly used to stay updated about the latest news. The songs are created by ultras members and usually the songs talk about the achievements of the ultras, the team or the city. Songs are done in different languages but the ultras prefer lyrics done in Italian because it manipulates the fans and make them stay dynamic. It is the use of flares in the stands. This supporting fashion appeared first in Yugoslavia and then swept quickly to the rest of world. The use of flares in the stands has added anther style and beauty to the mode of supporting, but sometimes it disturbs the players and makes the pitch invisible to them. This is why FIFA has taken some strict procedures against the use of flames in the stands. It is a French word which means process. The cortege starts at the bus or the train station to the stadium. This practice is intended to demonstrate the grandeur of the Ultras as well as the rising the anger of the host team’s fans. The ultras members, including girls and other Keniri fans, go in a procession using fames and singing their best songs. They always they try to appear heroic- going for a salvation mission, so to speak. Usually this cortege is announced days before on social networks and the ultras’ websites. This culture is deeply rooted within the ultras traditions. It is the notion of controlling the central square of the host city at the end of the match. This form of colonizing takes a few hours and the ultras celebrate it by using flames and songs. Colonization philosophy presents a great accomplishment in the ultras world. The host ultra never allows such things to happen in their territory and as a result this might lead to a clash between the two sides of fans. The idea of leader has no room within the ultras world, but they believe in the capos -somebody with more duties within the ultras. The Capos are in charge of hanging the banners, starting chants and coming to the meetings and the stadiums as early as possible. The Capos also represent the ultras in meetings related to tickets and violence either with the club‘s team or with the local authorities. Ultras members wear a green t-shirt which identifies them and makes them noticeable to others. The t-shirt should be worn by all the ultras participants in the stands, but outside it is an optional choice. The t-shirt is green and decorated with the logo of the ultras. The ultras’ t-short and hats can be worn by the other KAC fans as well. Keeping the same space is one of the most important principles of the ultras. Much weight is given to the location and fights can break out when the space reserved for the ultras is occupied by another group or fans. Ultras are usually located in what it is known in the language of ultras ‘Virage’ or ‘bend’ and it is only reserved for the ultras members. The bend is a strategic place since it is the space where the supporters can be controlled easily-it is the place where you can mobilize the whole stadium, for it is usually where the wave done by the fans starts and finishes. KAC stadium unfortunately does not have a bend where the ultras normally sit and demonstrate their rituals, yet the absence of the bend pushes HB Ultras to locate themselves in the stands where the poor and working class people usually sit. HB Ultras find more interaction with the fans in these stands than those in the grand stand which is occupied by well to do people who have no ‘roubla’ in their dictionary according to HB Ultras. I would say that the link seen between communism and ultras culture might boils down to the historic background of the Ultras. First ultras in the world were founded in countries which were attached to communism either in Latin America or in Eastern Europe. Communism is clear in not accepting the idea of a leader and in the ultras philosophy there is no room for leadership but there is responsibility instead; that is someone with more duties within the ultras called Capos. Second, they prefer sitting with those of lower social classes than being surrounded by well to-do people in the grand stand, as is the case of the Helala Boys ultras. Pictures and symbols of rebellious people are always presented on the stands like Che Guevara and the Palestinian flag. Many of their songs include revolutionary terminology like freedom, revolution, equality, etc. Helala boys sub culture has succeeded in finding a way into the dominant society in the city of Kenitra. First these fans appeared as a group of bohemian and deviant teenagers trying to create a unique football fan philosophy through their clothes codes, hair styles, songs and new form of supporting that was different from what Moroccans and Kenitri people in particular had been used to. 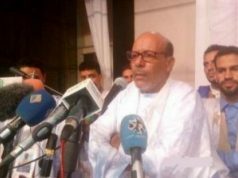 But few weeks after their founding, everybody upholds their philosophy in Kenitra. It is obvious that the ultras style was upheld by Kenitri citizens. Ultras lyrics were the driving force that enabled the group to have more fans and admirers within the city. Those lyrics popularity are due to their amazing tones repeated by most youth in the city which for sure pushes this sub culture to enter in short time to the Kenitri society and welcomed by almost all people. 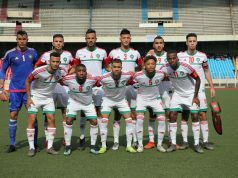 Keeping the same name which represents the City of Kenitra was also one of the main reasons that helped the Ultras to win the admiration of almost all people of Kenitra including the old. HB Ultras in Kenitra is no more a sub-culture but a pop culture which has enriched Kenitri culture and their rituals can be manifested by anyone belonging to the city of Kenitra.